China’s new DF-5A and DF-31A ICBM tests once again highlight its rising interest in MIRVed ICBMs. China tested two of its intercontinental ballistic missiles (ICBMs) last week, the Washington Times reported on Thursday. According to the Washington Times report by Bill Gertz, who cited unnamed U.S. officials, China tested its Dong Feng 31A (DF-31A/CSS-10) and Dong Feng 5A (DF-5A/CSS-4) ICBMs last week. The DF-5A is an upgraded version of the DF-5 ICBMs that China first tested in 1971. It is a three stage, liquid propellant silo-based missile with a range of 13,000 km and a throw weight of roughly 3,000 kg. 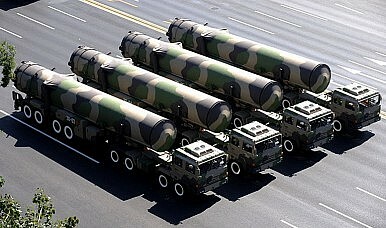 The DF-31A is China’s new road-mobile ICBM, based off the older DF-31 ICBM that China first tested in 1999. It is a three stage solid-propellant rocket with a range of roughly 11,200–12,000 km. This is the fourth known testing of the DF-31A ICBM. Its sea-based variant, the JL-2, will provide China with its first credible sea-based nuclear deterrent when it is deployed on China’s Type 094 Jin-class ballistic missile submarines (SSBN) sometime this year. Both the DF-5A and the DF-31A are capable of hitting the United States. The Washington Times article did not specify exactly where the tests had occurred, but it did not that previous DF-31A tests have taken place at China’s Taiyuan Space Launch Center in Shanxi Province in northern China. However, it seems quite possible that the ICBM tests were part of the ongoing military drills that China announced late last month in the eastern parts of the country. As previously noted, these drills have caused significant delays to civilian air travel in eastern China. Earlier in the drills, China conducted what it claimed was an anti-ballistic missile test, but which the U.S. believes was really an anti-satellite test. The earlier anti-missile/anti-satellite test, along with the new ICBM tests, underscore the growing attention China’s military is placing on its strategic and missile capabilities. Last week China inadvertently confirmed the existence of a new generation ICBM, the Dongfeng-41 (DF-41), which the U.S. Department of Defense has said may be capable of carrying multiple independently targetable re-entry vehicles (MIRVs). MIRV missiles can deliver multiple (usually nuclear) warheads to different targets, and were seen as widely destabilizing to the nuclear balance during the Cold War when the United States and Soviet Union began deploying them in the 1970s. The U.S. just phased out the last of its land-based MIRV ICBMs, although it continues to deploy MIRV submarine launched ballistic missiles (SLBMs). Russia continues to field MIRV ICBMs. Interestingly, the new reports about the DF-5A and DF-31A ICBM tests also highlight China’s potentially growing interest in acquiring a MIRV capability. According to the Federation of Atomic Scientists, “in November 1983 China inaugurated a DF-5 modification program to arm these ICBMs with MIRVed warheads.” Although technical difficulties prevented that program from reaching fruition, it is also believed that China later designated the DF-5A as its MIRV missile. It has also been widely speculated, including by the U.S. Department of Defense, that the DF-31A may be MIRV capable. Most analyses suggest that the road-mobile ICBM may be capable of carrying up to 3 warheads. At this point, most believe that China is only deploying single warheads on its DF-5A and the DF-31A ICBMs, although some foreign analysts have claimed that it has already MIRVed some of its missile forces. China's MIRVs: Sign of a Cold War to Come?Asia’s Coming Nuclear Arms RaceIndia’s Agni-V ICBM to Carry Multiple Nuclear WarheadsChina Isn’t Hearing Asia’s Fears About Its Military BuildupIs China’s Path to Military Parity With the US Through Intellectual Property Theft Doomed?